Code Breaker is a code breaking game of logic. Similar to the classic game Mastermind. Your aim is to crack the code fast enough to get a high score and make it onto our Master Code Breakers list. You get 8 attempts at breaking the code. If you can’t discover it by then then you lose that game. But that’s ok. You can get a new code and try again. The Code Breaker code is made up of 5 colours from the 8 available colours. To win you must place the right marbles in the right order. After each attempt you will be told how you went. White marble – Means that there is one of your marbles in the code but not in the right place. Black marble – Means that there is one of your marbles in the code and in the right place. The answer marbles are not in any particular order and don’t line up with your code marbles. Code Breaker has been designed to be easy to play on any browser as well as touch sensitive devices such as tablets and smartboards. Similar to the board game Mastermind, you can play against an opponent, or you can crack a computer generated code. To place a marble, select the color you want from the available colors at the bottom of the board then select the hole you would like to place it in. 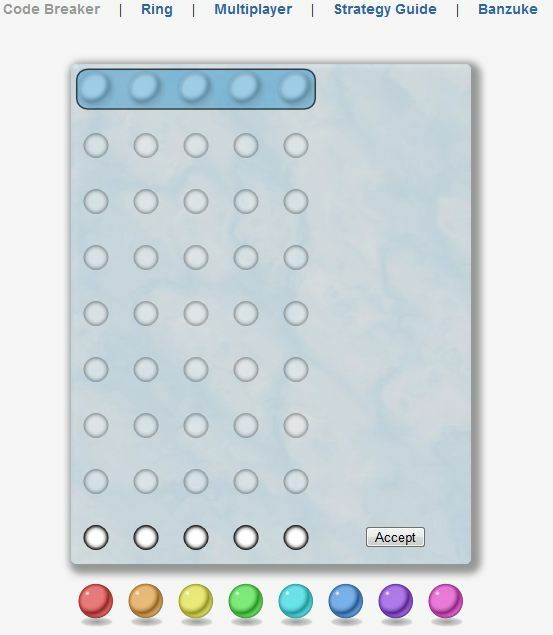 To move marbles around, select the first marble you want to move, then select the marble you want to switch it with. To play a new game simply click New Game on the right of the board game. To play with a time limit. Set the time limit then click New Game. To retrieve and play a multiplayer game, enter the code in the field where it says Code then press New Game. Similar games (such as Mastermind) don’t have scoring but some of our visitors are competitive so we thought we’d add a bit of fun. You’ll notice our Master Code Breakers list to your right. Scoring is quite simple and is as follows. 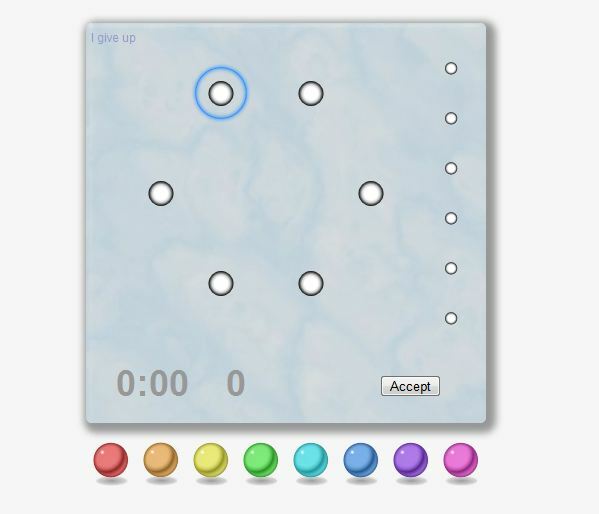 The game is timed from when you first select a coloured marble. Each second you take to discover the Code Breaker code is 1 point. Each attempt at cracking the code adds 30 points to your score. As you can see, it’s not just a matter of how quick you can be but also how few attempts at cracking the code as well. The lower the score the better. Get cracking and hopefully we’ll see your name on the board sometime soon.